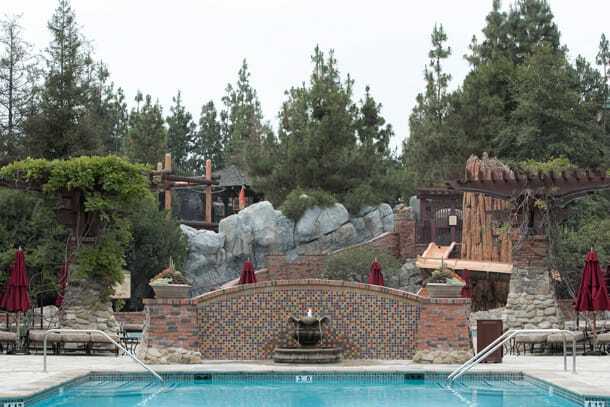 A few weeks ago, we shared details about the new guest rooms at Disney’s Grand Californian Hotel & Spa at the Disneyland Resort. 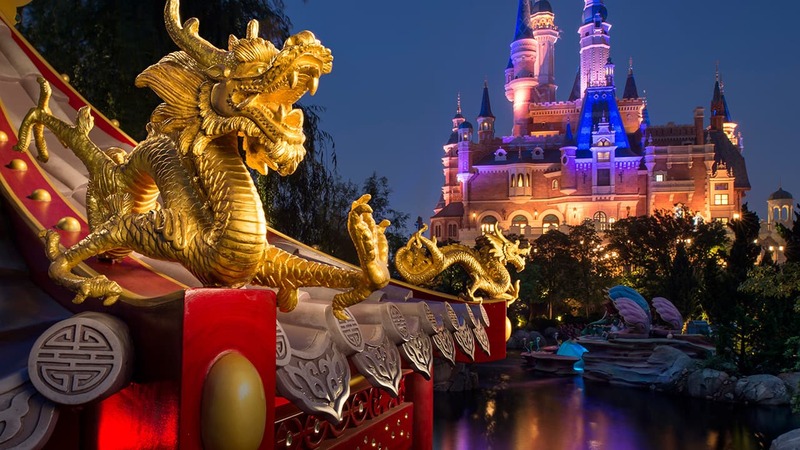 The resort is currently undergoing an exciting hotel-wide renovation—the most extensive refurbishment since the hotel’s 2001 opening. Guests have already been enjoying some of the updates—with many new guest rooms already available and the redesigned pool area now open for summer fun! Let’s take a look at some of the details found at our refreshed pool deck. Each pool area was designed with a variety of natural stones and brick to not only create a warm and welcoming environment, but also define three distinct pool settings. In keeping with the Arts and Crafts style of the hotel, the stone work was hand-laid by master stone masons. 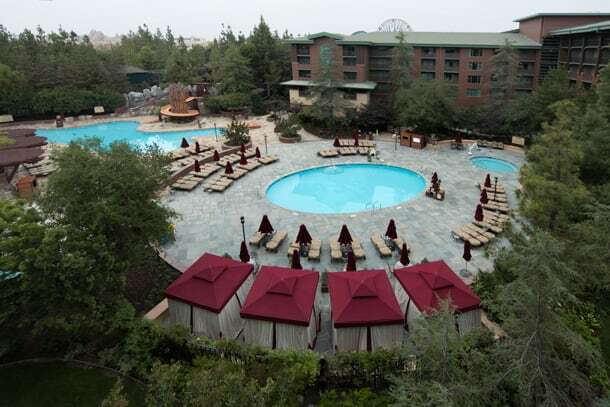 The Redwood Pool, with its irregular shape, features earthy, organic-feeling materials, including rustic brown flagstone and multicolored brick bands and slide accents. Situated just behind the Redwood Creek Challenge Trail in Disney California Adventure park, the 90-foot-long waterslide curves around a giant Redwood tree stump! Golden flagstone is used throughout the Fountain Pool. The new urn-shaped fountain serves as the pool area’s centerpiece. 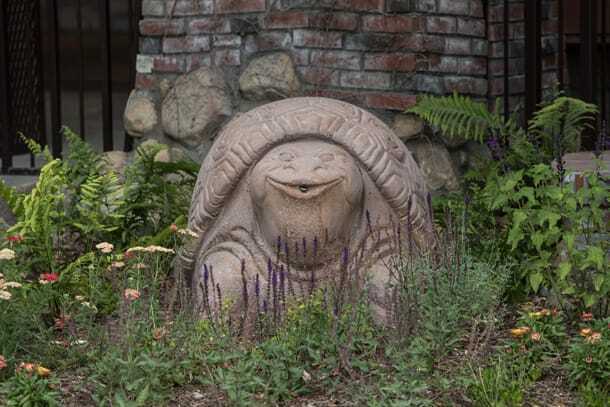 Our original turtle fountain can now been seen nestled in the garden as a fun addition to the Craftsman-inspired landscape. The quiet Mariposa Pool features serene bluestone laid in an ashlar (or rectangular) pattern creating a sleek look. For guests who wish to stretch out and relax, private cabanas line the edge and are available for half-day or full-day rentals. Which pool would you like to enjoy? When will the remodel be done?